It is very natural for a parent to wish and provide all things good for their baby. We are sure that you as a parent want the best for you baby. All the facilities, clothing, shelter, and not to forget the food! Well, as much as you’re excited to feed your baby with good quality fruits and vegetables, it is important to know if it is the right age to start giving that food. One such case is that of papaya. As healthy and beneficial it is for health, it is important for a parent to know whether they can give it to their baby or not. And if they can, mothers, especially the new one may not have an idea of the appropriate age to introduce this wonderful tropical fruit in their baby’s diet. Continue reading to find answers to your doubts. Papaya is a highly nutritious fruit. A single medium-sized papaya is a rich source of Vitamins A, B, C, and E. Papayas are also a good source of fiber and folic acid. It also has a significant amount of sodium, iron, calcium, potassium, magnesium, lycopene and phosphorus. Thus, papaya is very beneficial for healthy growth and development of the baby. Is Papaya Safe For Babies? Papaya is relatively safe to give the baby as it not high on the list of potential allergens and therefore, pose less risk of allergies. However, latex allergy and allergy to papaya are somehow linked. Therefore, in case your baby is having a latex allergy or if you have a family history of latex allergy it is recommended to introduce this fruit only after consulting your child’s doctor. When Can I Introduce Papaya To My Baby? Papaya has ‘n’ number of benefits for health. Here are six health benefits of papaya for babies. Improves Metabolism: It works as an aiding agent in the process of metabolism. Feeding your baby with papaya on a regular basis can help protect her/him her from potential cardiovascular diseases. Papaya houses an enzyme called folate which protects the blood vessels and walls from getting damaged. Combat Constipation: Papaya has been used for this purpose since forever! 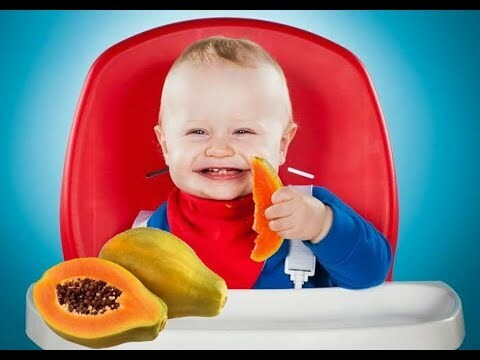 If your baby regularly experiences constipation, feed him/her with mashed papaya. This will work wonders. Eliminates Intestinal Worms: This is a very common phenomenon among babies. If your baby is above one year of age and faces this issue, you can feed him/her with papaya seed powder with honey. This shall address your baby’s issues. Boosts Digestion: Papaya is an excellent digestive agent. Not only for adults but for babies as well. Feed your baby with small amounts of papaya on a regular basis. This will help break down the complex food, and your baby shall never suffer from indigestion. Enhances Immunity: As we all know that a baby’s immunity system is not that strong as that of an adult. Papaya is a diligent amount of Vitamin C in it, which is a prime nutrient for immunity. Feed your baby papaya and keep all the diseases away! Heals Skin Sores And Enhance Eyesight: Papaya is a rich source of Vitamin A. You can use papaya pulp topically for minor skin burns, and mild sores/ rashes of your baby. Being rich in vitamin A, papaya enhances the eyesight of the baby. How To Select And Store Papaya For Baby Food Recipes? Now that we know the benefits of papaya, let’s have a look on how to choose and store the best papaya for your little one. Papaya is not as tough as it looks. It has a thick skin, but it is a rather delicate fruit. Always avoid using a papaya whose skin appears bruised. It may look like a little scratch, but due to the thick skin, the fruit might have rot underneath. Do not go for green papayas, they’re not yet ripe. Papayas that are towards the greenish side, with hints of yellow colour are good to go. They’re the perfectly ripe ones and are ready to use. If the fruit is not too green yet misses the yellow tint, you can use it for future use. It is wise to use purchase it if you plan to use it a day after. This way you can leave it to ripe on the counter and use it later. Refrigerating an unpeeled papaya gives it a chance of lasting long. If you’ve peeled your fruit already, store the chunks in an air-tight container and refrigerate them. Do not leave the left-over papaya unassisted. Either refrigerate it or consume it, if possible. Papayas ripe faster than expected. This might rot your left-over fruit. Make sure you give ripe papaya for your baby. Taste the fruit before giving it to babies. Never feed your baby an unripe papaya as it can bring about several digestive issues. You should introduce this fruit slowly to your baby. Start feeding a couple of spoons of mashed papaya every day for four days. Monitor the baby for signs of allergic reactions. Closely watch if your baby likes its taste and if it is affecting the digestion. If any sign of discomfort is spotted, immediately stop giving papaya to your baby. If the baby shows no signs of allergic reaction, you can continue to feed your little one this delicious fruit. Moderation is the key. Never overfeed your baby. A couple of tablespoon of papaya is appropriate for babies. Papaya can be given alone or you can even use it along with a variety of other fruits to make delicious purees. Avocados, apples, bananas, peaches, carrots, and yogurt go well with this fruit. Papaya is counted as one of the least dangerous fruits in terms of pesticide residues. This is owing to the fact that the thick, inedible skin that harbours pesticide residues is removed before using. However, you should thoroughly wash it before cutting. Take ½ cup papaya puree and ½ cup peach puree. Add whole milk plain yogurt, as per requirement. Optional: Finely chopped dry-fruits, or cereal. Your yogurt is ready to serve. Take one fully ripe papaya. Peel the papaya, deseed and cut into chunks. If required, steam the chunks to make them soft and easily consumable by the baby. Take the chunks and make a puree out of it. You can also mash it if that’s how your baby likes it. Take one tablespoon each of diced papaya and cantaloupe. Add ¼ cup of milk and beat well to make a milkshake. Is Alkaline Water Safe For Babies?